New knowledge created by scientists ought to find a direct and fast road to schools. But far too often, schools and research institutions turn out to be separate universes light years apart while the challenges of an ever-changing global society call for action. New tools have to be found, experiences need to be exchanged to let the next generation benefit from new insights as early as possible. This serves not only the purpose of accelerating the ‘cycle of knowledge‘, it can also help recruit a new generation of scientists as is desirable, for example, in the South Baltic area. 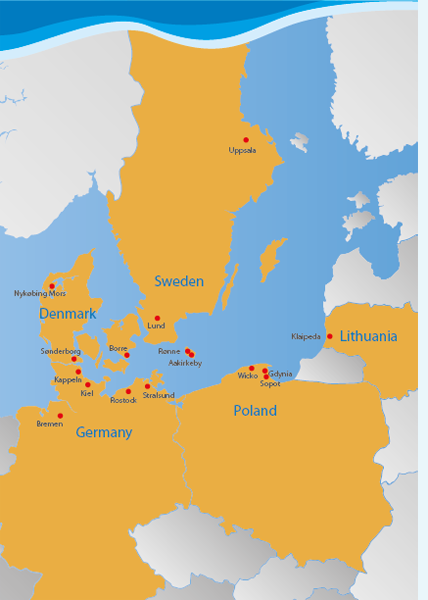 It is the aim of this database to inform teachers from all over the Baltic Sea area about some of these ‘science-meets-school‘ offers in a concise way and to facilitate the access to these offers. Last but not least, the database shall further encourage a cross-border exchange of ideas and experiences. It is exactly this exchange which has coined the Baltic Sea communities and made them what they are today. We need to go on with this fruitful tradition – with interested pupils, well-trained in natural sciences for the sake of a sustainable use of the Baltic Sea environment. Click on a country on the map! Sopot Science Picnic. A weekend with science! Sea Park - Education through Fun and Entertainment! Discover the mysterious aquatic world!